The people behind PokerTableRatings.com were kind enough to put down a few words about their poker hand histories and other poker tools. We offer a discount coupon of 10% on ANY PokerTableRatings Hand History order as part of the collaboration between the Poker Bankroll Blog and PokerTableRatings.com. Simply enter the code pokerbrb10 when checking out and you will automatically receive the discount. 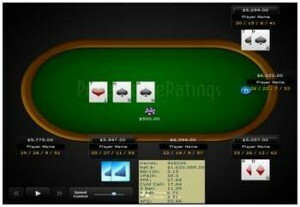 Why purchase poker tools from PokerTableRatings? “I want to be better at poker.” We’ve heard that sentence a million times. Here’s the secret to success: you need the right tools. That’s where PokerTableRatings.com comes in. We let you research your competition and find your own leaks. PTR supports all the major poker rooms (Full Tilt, PokerStars, Cake Poker, Bodog, Absolute, iPoker, OnGame and Party Poker) and player results are updated in almost real-time. You’ll be able to see how much money you, your friends, your enemies, or any poker celebrity has won or lost. The detailed player stats will show you what you’re doing different than the top winners and where your opponents have leaks. Best of all, you can get 10 free searches a day for just registering. For those players wishing to take their games to the next level, PokerTableRatings offers their Premium Content, an essential tool-kit for any serious poker player. Only $12.95 a month unlocks a variety of weapons specifically designed to arm you with the knowledge to crush your opponents. PTR provides Premium subscribers in-depth player statistics, position analysis, player modeling, and opponent match-ups from over nine billion hands. A WebHUD provides real-time stats on all the players at your table. 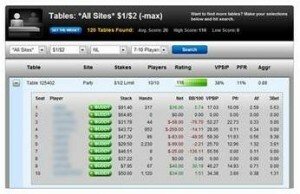 A Premium Table Finder helps you sift the waters for sharks and fish. That’s not all PokerTableRatings has to offer. Whether your game is Holdem or Omaha, limit or no-limit, PTR also offers hand histories from every major poker site—from micro-stakes to nosebleeds. Simply import the hands into Hold’Em Manager, PokerTracker or Poker Office, and you’ll instantly be able to see how often they’re raising from under the gun, how often they defend their blind, and more. PTR has recently launched their brand new Sit-N-Go hand histories designed to help SNG grinders gain a significant edge on their competition. Finding out if that tough regular continuation-bets JJ on a K♠10♠6♣ flop or checks for pot control could be the difference between going out on the bubble and making the money. PTR has been dedicated to tracking the online poker community and providing superior tools for improving players’ games since 2007. Whether you are an amateur or a long-time professional, PokerTableRatings.com is the place to go to increase your poker knowledge. So visit PTR to determine your own leaks, the leaks of your opponents, and take some time to observe how Phil Ivey and Tom Dwan play THEIR hands….you may be surprised and learn a thing or two. After you select the poker site and stake level, hit the checkout cart and it will show “$0.00″. If you have a PTR account, then you just need to checkout. If not, then it will prompt you to create an account for free so you can get the hands. These hands can be imported into Holdem Manager, PT3 or Poker Office. The hands are emailed to you in a zip file or they can go to your MYPTR section to download. Once you have used the offer, you cannot get the free hands again. If you have any questions about the hands or need help with downloading/importing, you contact support directly at info@pokertableratings.com. The support team responds very quickly! So basically, the software from PokerTableRatings acts as sort of a real time OfficialPokerRankings.com? Don’t get me wrong, it’s not a bad idea, as trying to look people up at your table while 10 tabling is a chore, but clean and informative HUD’s help me out a LOT when playing, so I’m expecting something with a bit more flexibility than what I see presented here. It still looks like a fairly quality site, though, so I still think I’ll give it a once over. Interesting read.